Hello, I am glad you found my site. I’ve experienced life’s transitions on many levels and am here to assist you, to coach you or guide your group through your tough times. You, like most women, probably like to have someone who can relate to your situation. My goal is to walk women like you through tough times. Journey with me on the path through single motherhood. Identify with my stories and learn ways to make your crooked places straight. The book can be read independently or used in a group as a study guide. I'm available to teach your group. When my three children were preschoolers my marriage to their father fell apart. I was devastated. Over time I revamped my life, raised my children, and developed really strong soul stamina. Now, it is my desire to be there for other women, sharing what I learned. Although I'm not a mother, married or single, I'm grateful for receiving Gail Showalter's book as a gift. 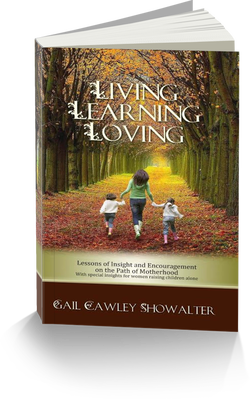 As I read it I realized this isn't strictly for single mothers but for anyone looking to navigate life's challenges through Gail's experience raising three children as a single mother. It's uplifting, inspiring and common sense advice that can be applied to men, women and even young adults starting out on an indepent life. I believe your mistakes in life are life lessons that you learn from. Gail has made it less complicated by sharing her experiences and hope- fully you'll learn for her hiccups in life and avoid some of the same pitfalls we all face daily. I will be continually referring to her book. It's a timeless, well written aid that you will wear out rereading passages over the years. -Debbie K.
Today, I want to share with you an encounter I had with an amazing person. Handsome couple, she and her husband, professional people, seemed to "have it all." Consistent with what we read about ways to stay grounded in life, this lady was laser-focused on a purpose. Not a whim, not "purpose of the week" or "subject to change." HER purpose: Mentoring single moms.